Before AMLO’s election win, doomsayers in the press and policy circles argued that the main risk to Mexico was that AMLO’s supposed dictatorial tendencies would lead him to disregard checks and balances, leading Morena towards a concentration of political power like the one carried out by the Institutional Revolutionary Party (PRI) in the past. But far from echoing mistakes of the past, AMLO has committed himself to bolstering the rule of law, upholding the independence of the three powers of government (as well as the Central Bank), and strengthening the judiciary in order to address rampant corruption and impunity. Crucially, the fact of making explicit these commitments to improve Mexico’s institutions means he can be held accountable if improvements fail to materialise. 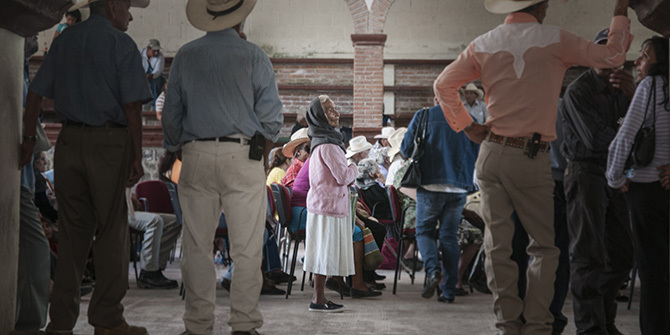 The Texcoco airport consultation: improving democracy? As mayor of Mexico City from 2000 to 2005, AMLO’s style of governance involved a great deal of popular consultation, and despite not yet having taken office, he recently made use of this tool to reach a decision on the future of Mexico City’s new airport. Throughout the presidential campaign, AMLO expressed opposition to the hugely expensive new airport at Texcoco, which experts considered “ecocide” because of its devastating effects particularly for the water system but also for the environment more broadly. He announced in December 2017 that as president he would halt construction, but he later changed his mind several times during the campaign, and ultimately called for a “popular consultation,” which he had proposed at different times during the campaign. Though superficially favourable to democratic participation and legitimacy, this was a colossal mistake. First of all, because the consultation took place without AMLO in the presidency, it had to be run by an NGO rather than the state: this left much to be desired in terms of organisation, transparency, and representativeness. The consultation involved less than one per cent of the electorate, which made it hardly representative. It has also become increasingly clear – we need look no further than Brexit – that consulting voters who lack the technical and financial qualifications to evaluate crucial but complex issues can be ineffective and deeply problematic. The consultation appears to have been an attempt both to burnish his democratic credentials in the face of criticism and to do as Pontius Pilate did by transferring responsibility for a difficult decision to “the people”. But this was unnecessary. With an impressive 60 per cent turnout on election day, and more than twice as many votes as his nearest rival (53%), AMLO already had a clear mandate to make major policy decisions like this one. And by employing instead a flawed popular consultation, AMLO has done political damage that could also have economic effects. The decision to stop the construction of the new airport, slightly more than a fifth of which has already been built, needlessly upset markets and investors. It also means that he has foregone the opportunity to start his six-year term with a bold policy decision consistent with his campaign pledges. More of the same for Latin America’s “star economy”? Just as expectations of democratic degeneration are wide of the mark, so too may be expectations of economic continuity. The World Bank statement that Mexico’s economy represents the “shining star” in the Latin American firmament about which there is “least reason to worry” ignores numerous challenges that AMLO will face once in office. As soon as 15 December the incoming president will have to pass his budget for 2019. This budget must include a new fund for AMLO’s 25 “strategic projects”, which relate mainly to campaign pledges in infrastructure and social areas. These projects are to be financed through savings from his austerity plan and anti-corruption practices rather than from increases in taxation or debt. AMLO has signalled his personal dedication to making savings by cutting his own salary in half and forgoing other benefits. Pensions for former presidents have also been eliminated, and the Senate has agreed to a 30 per cent cut in its budget. AMLO has stated that this mega-consultation is a response to “conservative” critics who had claimed that he only went to the people on projects to which he was opposed, such as Texcoco Airport. He made clear, however, that while he was impartial on the airport consultation, he is very much in favour of these ten projects, as his campaign clearly demonstrated. Moreover, and returning to the airport issue, it remains unclear what budgetary adjustments will need to be made in order to finance the new proposals to expand airport capacity. The state will also have to compensate investors and contractors as a result of the cancellation of the Texcoco project. Though he rightly asserts Mexico’s sovereign right to decide its own policies, if AMLO fails to comply with commitments made by the previous government, rating agencies will likely downgrade Mexico. This would make borrowing more expensive, discourage investment, and increase the burden of debt servicing, not least because under Peña Nieto public debt rose from 33 per cent of GNP in 2013 to 47 per cent in 2018. These conditions would in turn make it harder to boost lacklustre growth – an annual 2.0 per cent since 2000 – and undermine efforts to make the economy more dynamic and inclusive. The World Bank, however, believes that under AMLO this “stable economy” will continue to expand. But they fail to explain how a stable economy with star qualities and so much borrowing can have led to such poor results in terms of growth, poverty, and inequality. The Credit Suisse Global Wealth 2018 report shows that 96 million people either live in poverty or risk falling into poverty. Yet, 39 individuals have wealth totally over $500 million dollars and 266 other have $100-500 million. Unsurprisingly, Mexico’s Gini index makes it one of the most unequal countries on the planet. 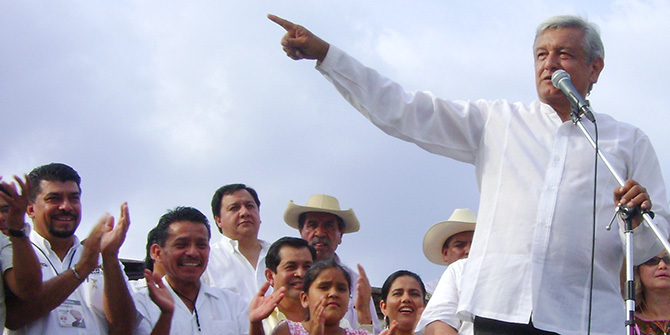 AMLO was elected in great part to deal with these issues, and the challenge will be to tackle the general malaise in areas such as security, corruption, impunity, growth, poverty, and inequality without putting at risk the significant gains that have been achieved in financial stability, trade, investment, and the productivity of various sectors. Dr Graciana del Castillo is senior fellow at the Ralph Bunche Institute for International Studies and a member of the Council on Foreign Relations. She holds a PhD in Economics from Columbia University, where she was Adjunct Professor, Senior Research Scholar, and Associate Director of the Center for Capitalism and Society. As a director of Latin American sovereign ratings at Standard & Poor’s, she led Mexico’s credit upgrading to investment grade in 2002. She has published extensively and is the author of Obstacles to Peacebuilding (Routledge, 2017), Guilty Party: The International Community in Afghanistan (X-Libris, 2nd edition 2016), and Rebuilding War-Torn States (Oxford University Press, 2008). A most useful overview. I hope Graciana will continue to provide commentaries on how the AMLO Presidency continues in general and with respect to the 10 projects.